I have always told my children that doing the right thing is seldom the easy thing, but it is ALWAYS the right thing. Does that make sense?? A modern example of that is happening to a friend of mine right now. To make a long story really short, a man at his church was showing inappropriate (a nice way of saying pornographic) pictures to children. My friend did the right thing, which is to call the police!! The problem comes in the fact that the family of the man has really given the church staff a hard time FOR CALLING THE COPS! And good people are standing by and letting this happen! It is bad enough that people, no matter how influencial they are in a church or community, would desire to cover up this kind of sickness. But my friend did the right thing . . . And God knows that. And I believe God will hold that family (AND anyone who stands by and lets it happen) accountable for all of the hurt and damage they cause the staff of that church. It amazes me when good people will stand by and watch bad things happen and do nothing. Sometimes we just don’t want to be bothered. PEOPLE, those moments are the very times we MUST take a stand!! So, if you did the right thing and are catching the full fury of whomever for it, ride the wave . . .God has the last say in this matter, and He will not leave you swinging in the wind. PS – Two things about this post: My friend does not live ANYWHERE NEAR FLORENCE, so don’t try to think this is a local church. He is far away. ALSO, if you are going to post a comment to this, at least be man/woman enough to SIGN IT. And then I MIGHT be willing to post it. Is it enough that most of the Clemson faithful were ready to CAN HIM if he lost to USC?? After a year of ONLY THREE LOSSES?? What kind of sheriff do we have??? I had another funeral today . . . Not my favorite thing to do, but a fact of life for any pastor. It makes things a little tougher when it is a friend, and Willard Anderson was a friend to me. Tough day. After the funeral, we lined the cars up to process to the graveside. The Florence County Sheriff’s Department, which always does a great job assisting funeral processions, was called away at the last minute. Sometimes that does happen. What happened next was really neat and one of those things our sheriff does . . . Behind the scenes . . . No TV cameras or press at this funeral. But our sheriff, Kenney Boone, who was attending the funeral, found out that his guys were detained. So, he drove his unmarked vehicle to the front, turned on his blue lights, and led the procession to the Florence Memorial Gardens. I will guarantee you that very few people knew who that was in that white Suburban . . . Rolling up his sleeves and working . . . But, I am not at all surprised. That IS Kenney Boone. Not looking for the glory, just getting the job done. THAT IS THE KIND OF SHERIFF WE HAVE. And I appreciate him for it!!!! And you probably won’t hear about this on TV-13 or any other news outlet, but that is NOT why he did it. He did it because it needed to be done. Yep, I really don’t have a heart to blog today . . . Sometimes Monday can bring an empty feeling to a pastor. That is why many pastors take Mondays off . . . They say we should NEVER make a big decision on a Monday. Today I feel it, and I know why they say that . . .
“How much do you charge?” John asked warily. “Each visit is $150,” replied the doctor. If being disgruntled is a bad thing, what is gruntled and why would I want to be it? There it is . . . 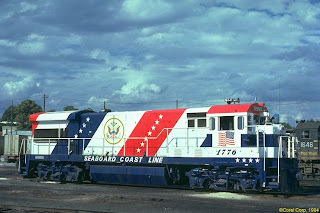 The REAL Spirit of 1776 Seaboard Coast Line engine. The TYCO version (I guess it was an L series) was the first toy train I ever got. AND DREW FOUND IT THIS WEEKEND!! So, we found a good spot on mom’s den floor and set it up. From two trains and two track sets we got a good little test circle and fired it up! The bad news is the Spirit of 1776 was not running well. We are going to have to work on it a little . . . But the Rock Island engine was running pretty good. So, it looks like we will have a train set up somewhere in the house this Christmas!! Don’t tell Diana . . . I am SURE this is not in her Christmas decorating plans. We might have to hide it.